As the oldest brother to four siblings — three brothers and a little sister — I find this ad very touching. I paused several times as I read it. 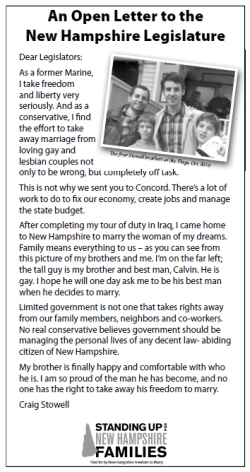 It’s running today in the Union-Leader, New Hampshire’s widely read (and conservative) newspaper. As a former Marine, I take freedom and liberty very seriously. And as a conservative, I find the effort to take away marriage from loving gay and lesbian couples not only to be wrong, but completely off task. This is not why we sent you to Concord. There’s a lot of work to do to fix our economy, create jobs and manage the state budget. After completing my tour of duty in Iraq, I came home to New Hampshire to marry the woman of my dreams. Family means everything to us – as you can see from this picture of my brothers and me. I’m on the far left; the tall guy is my brother and best man, Calvin. He is gay. I hope he will one day ask me to be his best man when he decides to marry. Limited government is not one that takes rights away from our family members, neighbors and co-workers. No real conservative believes government should be managing the personal lives of any decent law- abiding citizen of New Hampshire. My brother is finally happy and comfortable with who he is. I am so proud of the man he has become, and no one has the right to take away his freedom to marry.